This easy kimchi recipe is a speedy version of the traditional Korean kimchi ! Chock full of vitamins and pro-biotics, this mak kimchi is the perfect healthy side dish for any Korean meal. Good authentic homemade kimchi is much easier than you think. Cut up the cabbage, salt, rinse, and mix with the seasoning! Simple, right? That’s what this easy kimchi recipe is about. The Korean word “mak” means “carelessly” or “roughly” (generally used as an adverb). The name mak kimchi (막김치) suggests this is carelessly (or roughly) made kimchi. Sounds kind of fool-proof, right? Now, of course, all kimchi types are made with care, but the name comes from the shortcut method used to make this an especially easy kimchi, at least as compared to the method used to make traditional kimchi (aka pogi kimchi). 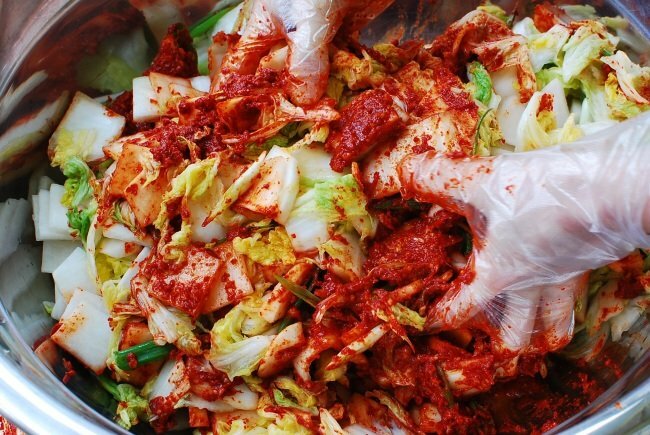 Pogi kimchi (포기 김치) is made by quartering the napa cabbage heads, salting for many hours, and carefully stuffing each leaf of the quartered cabbages. To serve, the cabbage quarter is cut into bite-sized pieces. 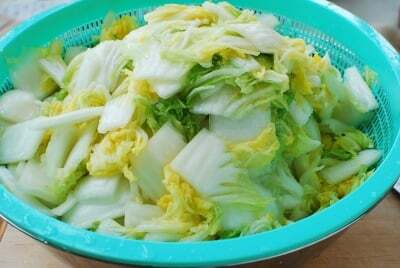 On the other hand, for mak kimchi, you roughly chop the cabbage up into small pieces before salting and then toss it together with the seasoning. This method takes less salting and fermentation time. There’s no argument that pogi kimchi has a deeper flavor and better texture because of how it’s prepared. Nevertheless, for something simpler and quicker, Korean cooks turn to this mak kimchi. Trust me, it’s still tasty! When I make this easy kimchi recipe I almost always add some mu (Korean radish) just like my mother and mother-in-law used to. Not only does kimchi taste more refreshing with the radish, but it’s like having two different kinds of kimchi in one dish. You can dress it up by adding other ingredients like Korean pear, oysters, garlic chives, glutinous rice paste, etc. If you like lighter tasting kimchi, simply reduce the amounts of red chili pepper flakes, salted shrimp, fish sauce, and/or garlic. If you don’t have salted shrimp, just add more fish sauce (and salt if needed) to achieve the desired salt level. How long can I keep homemade kimchi in the fridge? Your homemade kimchi will continue to age in your refrigerator, and this type of kimchi will be good for a month or two or even longer, depending on the salt level. Have you tried this kimchi recipe? Please rate the recipe below by either clicking the stars or leaving a comment! And make sure to share your creations by tagging me on Instagram! Stay in touch by following me on Pinterest, Twitter, Facebook, and Instagram. This easy Kimchi recipe is the speedy version of the traditional Korean kimchi and makes fermentation seem way less scary. Chock full of vitamins and pro-biotics this Mak Kimchi is the perfect healthy side dish for any Korean meal. Cut the cabbage heads into quarters and remove the core from each quarter. Cut each quarter crosswise into bite sizes (about 1-1/2-inches). Place the cabbage pieces in a large bowl(s). In a smaller bowl, dissolve 1-1/4 cups of salt in 6 cups of water. Pour over the cabbage. Toss well to wet the cabbage pieces evenly with the salt water. Let stand until the white parts are bendable, about 2 hours, turning the cabbage pieces over occasionally. Cut the radish into bite sizes (about 1-1/2-inch square, about 1/4-inch thick). Sprinkle with a tablespoon of salt. Toss well. Let it sit for about 30 minutes. Drain. Do not wash. Mix the chili pepper flakes with the remaining seasoning ingredients along with 1 cup of water. Rinse the salted cabbage three times and drain to remove excess water. In a large bowl, add the radish, scallions and seasoning to the salted cabbage. Using a kitchen glove, mix everything well by hand until the cabbage pieces are well coated with the seasoning mix. Place the kimchi in an airtight container(s) or a jar(s). Rinse the bowl with 1/2 cup of water by swirling around, and pour over the kimchi. Leave the kimchi out at room temperature for half a day to a day, depending on how quickly you want your kimchi to ferment. Then, refrigerate. Hi! Question! If you don’t like the salted shrimp do you substitute with more fish sauce? Thanks! Love your website! It has helped me with a lot of dinner ideas! Yes, just add more fish sauce (and salt if needed) to achieve the desired salt level. I’m very happy to be helpful. Thank you so much for using my recipes! You’re welcome! I’m happy to be helpful. Thank YOU so much for the nice words!! It means a lot to me, especially when they are all the way from Sweden. Hi, I dont have white rice paste but I do have white rice flour & brown rice pastry flour, is it used for thickening?my kim chi is made, cant wait to try it! Thank you for an easy recipe! I have a different question!!! 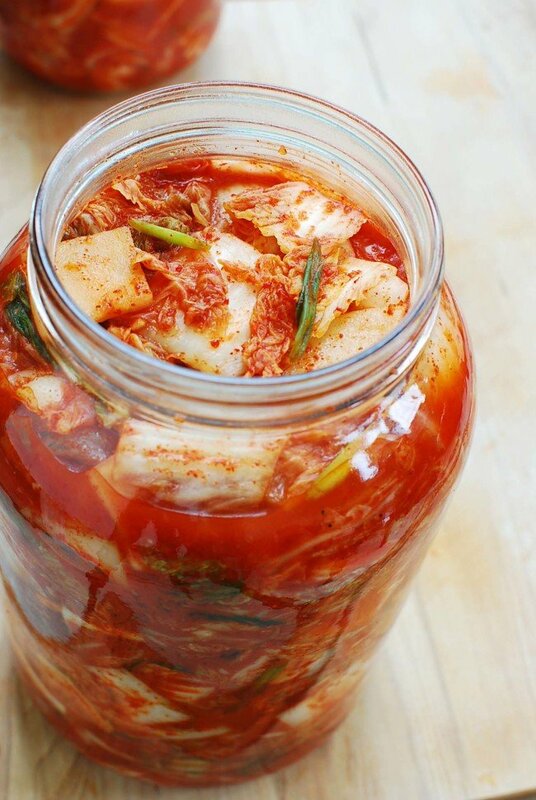 How long can homemade kimchi be stored in the refrigerator? Kimchi can keep well in the fridge for weeks and months.Thanks! Is the Daikon Radish the same thing as a Korean radish? In general, all white radishes are known as daikon here in America. Daikon is a Japanese name. There are different varieties of white radish. Korean radish is usually rounder, juicier, and crunchier. 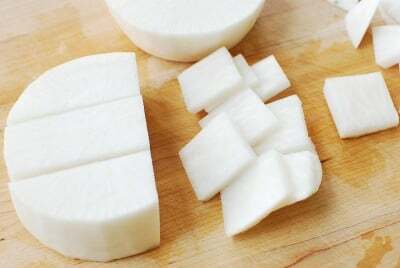 If you can’t find Korean variety, you can use Japanese daikon. Hope this helps! Thanks for coming by! I’m going to make kimchi but i don’t want to use fish sauce and salted shrimp.Because my husband has gout and he shouldn’t eat much salt. here is the question; Does the same flavor of kimchi? Can I make my kimchi for them either way? I’d be very happy if you answer my question. hopefully I can make delicious kimchi! Hi Rose – You can make kimchi without fish sauce and salted shrimp. It will taste much lighter, but still be tasty. Kimchi with less salt is more suitable for quick consumption, so I suggest you make a small amount (half of this recipe). Hope this helps. Cheers! Hi Huda! There’s really not much you can do about the sugar already in kimchi. Adding a little more salt can help a little but you don’t want to do that if it’s already too salty. I’m not sure how much you put in, but let it mature and see how it is. It might be okay. i would make a second batch or the kimchi without the sugar and when it is ripe to eat i would mix the 2. Yes, you definitely need to use more salt if not using salted shrimp and fish sauce. Kimchi should taste a bit salty when it’s made. hmm I always use salted shrimp and fish sauce, so can’t tell you off the top of my head the amount of salt you need if you don’t use salted shrimp and fish sauce. Just start with a couple of tablespoons and add more as needed. The seasoning should be a bit salty. You can also adjust the seasoning after mixing with the cabbage. Again it should be a bit salty to eat as is. Kimchi without salted shrimp and fish sauce will not have the depth and pungency kimchi usually have. Try to add 1/ 4 of Korean pear and/or glutenous powder paste (see my pogi kimchi recipe) to help a little. Hope this helps. Thank you! Homemade kimchi is the best. Enjoy! Hi, after leaving it to ferment for a day, my kimchi seems to have turned watery. Is it because I did not salt it heavily before? Is this batch ruined? During the initial salting process, the cabbage and radish release a lot of liquid, which is drained. So if you didn’t salt enough in the salting process, the vegetables will release liquid during the fermentation process. Your kimchi should be fine to eat. And kimchi juice is delicious. However, kimchi that’s not salty enough will turn sour quicker, so not good for keeping long. Hope this helps. Hi, Hyosun. I’m Stephanie from Malaysia. i’m very interested to make kimchi but i can’t find the korean chili flakes. What should i do? Thank you for the info! Hope Stephanie can find the ingredients in Malaysia. Hi Huda! I’m from malaysia too. Where do you buy your napa cabbage and radish from? Can i use the china cabbage that looks like napa cabbage? Similar cabbage can be used for this recipe. Also, omit the radish if you can’t find. Just use more cabbage. Hope Huda sees your question too. Thanks. hi Alex. i bought all veges in market (pasar basah). is there any different between napa n chinese cabbage? hehe.. like madam Hyosun said chinese cabbage can ne used also. I, too, (in Spain) have difficulty finding several of the ingredients. I have tried replacing the radish with julienned parsnip and find that it adds a bit of crisp crunch, but is a bit bitter. I found some Vietnamese fish sauce, which I use with Thai food, but it doesn’t taste quite like the Korean kind. Dear Hyosun, I just made your recipe using local ingredients (Turkish pul biber chili flakes, Indonesian trassi and palm sugar). The whole apartment smells very exotic right now! My question is, if I want to give a pot away as a gift, should I pasteurize it as I can’t be sure how it will be stored or used? We Koreans don’t pasteurize kimchi. I’m not familiar with those ingredients you used, but kimchi should be okay if salted properly. Dear Hyosun Ro, the local ingredients available in Holland (from an Indonesian store and the vegetable stall on the market) worked wonderfully well. Thanks you so much for sharing your knowledge. That’s great to hear! I know many readers out there have problems finding the ingredients. Thanks for coming by to let me know that. First of all, a lot of salt used gets washed away after salting the cabbage. As a result, kimchi does not contain all the salt used in the recipe. If you’re concerned with the salt level, make it lighter with less salt and/or eat it in moderation. My wife cannot tolerate the heat from red pepper – could I use chile powder which contains other things like cumin? Also, how about Asian spice as an addition for additional flavor? Thanks. 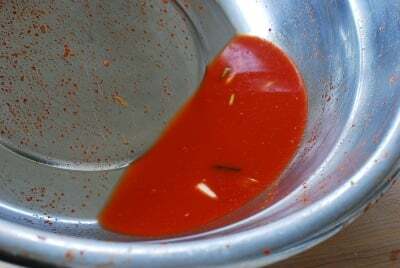 You can reduce the amount of red chili pepper flakes to 1 or 2 tablespoons just have some color but not enough to make it spicy or omit entirely. 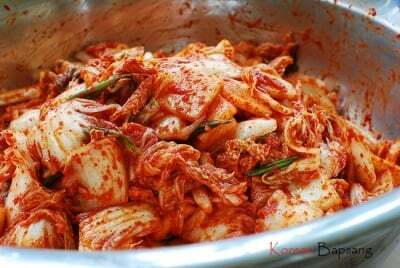 Koreans also make white kimchi which is kimchi made without red chili pepper flakes. I’m sure other spices wouldn’t hurt, but the flavor would be quite different from traditional kimchi. Hope this helps. hi, I am writing from Poland, where not all the ingredients are available….I mixed a few recipes up and I think the result is not too bad…mine is a simple vegetarian kimchi, with cabbage (following the salting, soaking and draining method), carrot, ginger, garlic and chili powder….one question, I am leaving it 2-3 days in glass jars in a warmish kitchen (the lids are not too tight, so liquid can bubble out), what should I do next? close the jars and keep in the fridge? will it keep fermenting?should I leave it at room temperature for longer? jars tightly closed or not? 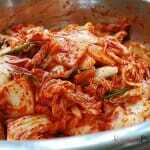 alex – 2 to 3 days is more than enough for kimchi to be left out at room temperature. Keep it in the fridge tightly closed. It will continue to ferment. Hope this helps. Hi there, I am writing from New York. how long will the flake red peppers last if I put it in the freezer? I have an old one from a few months ago or should I get a new bag? I was just there over the weekend. Visited my son in Brooklyn and went to Flushing for a Korean dinner. It should be fine for a couple of years in the freezer. No need to buy a new bag. Hellow today I’m buying all the ingridient for this recepie but I have one question..I love seafood and I wonder if I can add fish or oisters to ur kimchi recepie?? Yes you can add a little. Enjoy! It doesn’t have to be in a jar. You can use an airtight plastic container as well. Yes, you need to keep it in the fridge or it will become overripe and sour too fast. Hope it turns out well for you. Thank you for trying out my recipe! Thanks so much for this recipe. I just made it this weekend and it’s soooooo good. It’s a little too hot for my hubby so I’m use less red chillies next time. I just can’t believe kimchi can be so easy to make! Thanks again! Awesome! Thanks for letting me know. I’m so happy to hear you find it easy to make kimchi. i have a problem, my mother made some kimchi and it turned out too salty. any way to fix it. she said use 1/2 tsp vinegar and 1/2 tsp sugar until the desired flavor. Depending on when you made it, you can also add more water to dilute or more cabbages without salting. You can also cut up some white radish and add. Also, the saltiness reduces as it ferments, so put it out and expedite the fermentation process. Hope this helps. Thanks for the recipes. This would be my first attempt at kimchi, but not at fermentation. I own a 5L fermentation crock, with which I make sauerkraut regularly. To do this I have the cabbage submerged in brine, then leave it in the airtight crock for 2-4 weeks in a cool part of the basement. I’m surprised to see kimchi as having a much shorter ferment. Are there recipes or suggestions for a longer ferment? My thought is that would be more traditional, and could generate more flavor. We do keep kimchi for weeks in the fridge (or in a cool place), during which time kimchi will continue to ferment. And you’re right. As it gets older, it generates more flavor. Hope you try the recipe! Just one question if you have a minute… Can you use dry spices, like ginger and garlic? You can if you want, but most Korean home cooks don’t use dry ginger and garlic in kimchi. I highly recommend that you use fresh ginger and garlic. Last night I made kimchi stew with kimchi made two years ago. It was quite acidic so I added some doenjang and a diced potato. Since I’m on a diet, I used diced chicken-apple sausage for more unami flavor. So you can keep that kimchi for a long time but after two years don’t expect much any crunch. I also added more gochugaru since time had mellowed the heat, It wasn’t a traditional kimchi stew but it was still fantastic. I just discovered your site and like it very much. You have a variety of dishes I’ve not seen on other Korean food blogs. Wow 2 years! I don’t think I ever had it that old. 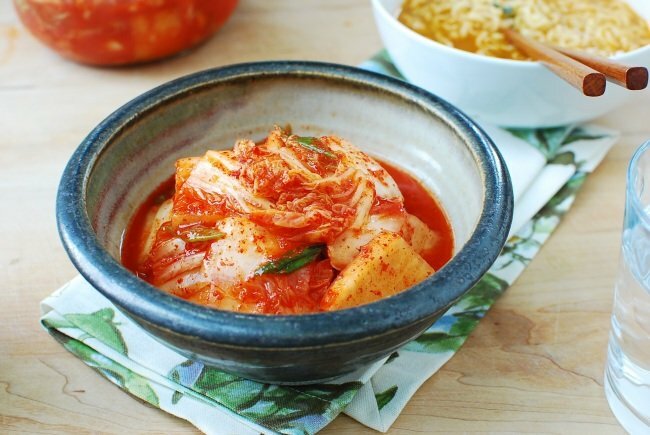 You kimchi jjigae sounds so creative and delicious! Thank you very much for finding me!! Hope you enjoy my recipes very much. Thank you for all your recipes. I tried your japchae recipe this evening and my husband loved it! I would like to try this recipe too and am wondering if I can use hot pepper paste to replace the chilli flakes? Thank you! You should really use Korean chili pepper flakes for kimchi. There’s no substitute if you want to make authentic kimchi. Cheers! Hi, I made this recipe last week. The kimchi is a bit too salty so I added a bit of water to dilute it. I was also wondering why mine has a dark red color and not the bright red that your picture shows? I really want to start making homemade kimchi regularly, as it is so much better than store-bought! Thanks for your wonderful recipes. Hi Jeannie – It’s most likely the gochugaru that’s dark red. Try to find good quality gochugaru. It makes a big difference in color and flavor and is worth paying more. 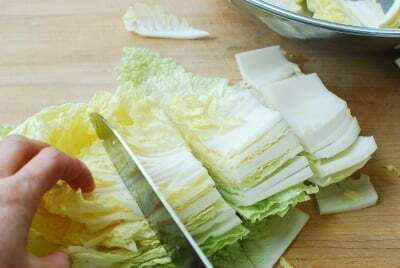 Some of the things that can help with kimchi being salty – use coarse sea salt to salt the cabbage, wash the salted cabbages thoroughly, taste the washed cabbage and wash more (or soak in water for a couple of minutes) if salty, or reduce the amount of salted shrimp/fish sauce. Don’t give up – it will only get better as you make more often. And you’re right homemade kimchi tastes much better. Let me know if you have any other questions. I love your blog! I was involved in a small Korean community for a couple years in my hometown and I fell in love with korean food! I moved 3 years ago and I miss it so much so I’m trying to make it on my own. I have a hard time finding Napa cabbage so I was wondering if I could use a regular one. Does it taste bad if a use a different kind of cabbage? Hello Adriana – You can definitely make kimchi with other types of cabbages. Here’s my recipe for kimchi made with green cabbage. 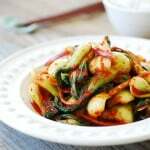 http://www.koreanbapsang.com/2011/07/yangbaechu-kimchi-green-cabbage-kimchi.html#.VBJQLGRdVX4 Enjoy! Hi…how can i subscribe your blog? I followed some of ur recipie and it is great. My hubby said no need to go to korean resturant and eat anymore. There are some social media buttons at the top right hand side under “follow me” on my website. I’ll be adding the e-mail subscription feature. It disappeared when I changed the blog hosting. Thank you so much for the good words! Not sure how it will taste. I’ve never tried it. You can try it and let me know. Hi Hyosun! This recipe looks fabulous and I cannot wait to try it! If I wanted it to ferment longer (like 2-3 weeks) should I add more salt/salty things? If so, how much would you recommend? No that’s not necessary. This kimchi can ferment for weeks in the fridge. First of all, thank you for all those recipes and especially kimchi-related ones ! I love kimchi ever since I’ve tasted it. I would like to try your recipe (autumn is there and winter is coming..) but I would like to add some ingredients like soy sauce, sesame seeds and sesame oil. I’ve read sesame (oil and seeds are a healthy addition). What do you think ? Also, would it make a significant difference if I make a glutinous rice powder paste ? Greetings from France and Long live Korean food ! Sesame seeds are common in kimchi. Soy sauce and sesame oil are not traditional kimchi ingredients. I wouldn’t add to Kimchi. If you like to add some sesame oil, add a little when you serve/eat. You can add glutinous rice powder paste. Enjoy! 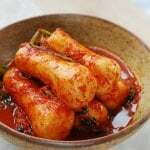 Hello, I really want to try to make this sometime but I have always been afraid to make kimchi because I have heard stories about it fermenting too long or not long enough, or if you don’t use enough salt it could rot rather than ferment, any suggestions to prevent that and it is much of a concern? Isi it dangerous to make your own kimchi? Almost every household in Korea makes kimchi at home. It’s quite safe. Just follow a good recipe. It would be fine. 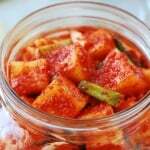 Kimchi is a very famous as well as healthy Korean food. It can be enjoyed in a Korean restaurant or made at home easily. Thank you for your blog. I am amazed out how easy and quick kimchee is to make. I travelled to Korea in the 1970s and 1980s and loved to eat kimchee back then. I did not eat it for many years, but last year I began to eat it daily. I had been hospitalized and given antibiotics, which destroyed my good gut bacteria. To restore those I read that fermented food was beneficial, so I began to eat sauerkraut or kimchee everyday. Doing that dramatically improved my indigestion and I am certain its kimchee working. Also, I have chronic pain of fibromyalgia, and I read that chili peppers are good for reducing inflammation. Sauerkraut is easy to find, but I much prefer kimchee and am now ‘addicted’ to it. I can’t get enough of it. I understand now why Koreans eat it every day. There is one supermarket in my small town on the west coast of Canada that carries a good quality kimchee, but the supply is sporatic. I have managed to eat it most days, but sometimes go a month or more before a new supply arrives so switch to sauerkraut. So, I started to research making my own kimchee and found your blog. Today I went to that same supermarket hoping to find the ingredients you list for kimchee. I can get the cabbage, garlic and ginger no problem, but I have had to substitute or omit some of the other ingredients. For example, I could not find Korean fish sauce, but I got a good one from Thailand that’s probably very close, anchovy based. I also could not find salted shrimp or Korean chili flakes. So, I am making my first test batch today. I am just using regular red chili flakes and that fish sauce, but no shrimp. Hopefully it will work out but I will be asking the supermarket manager if I can special order those ingredients and do it properly according to your recipe. Hi Perry – I’m glad to hear fermented foods are helping you with your health issues. Yes, kimchi certainly is addictive! Thai fish sauce should be fine, but have you tried on-line for Korean chili flakes? Hope your health conditions continue to improve. Thanks Hyosun. How soon can I start eating the kimchee after leaving it at room temperature for a day? I’ll let you know how my test batch worked out. Thanks for the shopping tip. It didn’t occur to me to order online. You can start eating it any time, but kimchi usually takes about two weeks in the fridge to fully develop the flavors. If you didn’t use all the ingredients, it’s probably better to be eaten sooner than later. Enjoy! Hi again. I’m so excited because my first test batch was successful and I have found an asia market about an hours drive away that carries all the ingredients I need. I used substituted ingredients and no shrimp for my first two batches so it would not impress someone who’s eaten kimchee all their life, but it was pretty good. And it will be even better when I start using authentic Korean ingredients. The ready made kimchee I used to buy used chili pepper paste instead of flakes. They probably used the paste listed on your products page: Gochujang (고추장) red chili pepper paste. But your recipe calls for flakes. Is there a reason you prefer using flakes over paste? 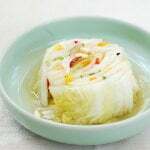 You also say glutinous rice paste can used. What role does that play? Thanks again for help. I’m so excited I can make my own kimchee now. 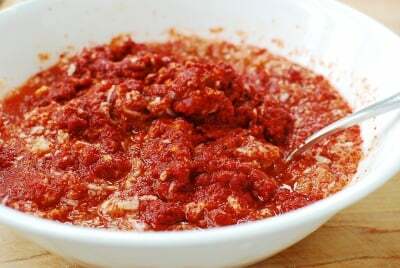 It’s not common to use gochujang (paste) in kimchi. It’s too thick and sweet for making kimchi. Gochugaru (flakes) is THE most important ingredient for kimchi. Among other reasons, the rice paste promotes fermentation by feeding healthy bacteria and helps develop the flavors of kimchi.I am so proud of you for making your own kimchi. And it will only get better every time you make it. Happy kimchi making! Hi again. I have now made my first batch of kimchee using the authentic ingredients in your recipe. It is absolutely fantastic, it even tastes better than the kimchee I used to buy, which I think is true of most home-made foods. I learned a lot from the comments here and your replies, Hyosun, so here’s a couple things I’ve learned so far that might help others. I now understand why you say above: “Gochugaru (flakes) is THE most important ingredient for kimchi. ” I was mistaken in my comment above that the kimchee I bought ready made listed red pepper paste. It was not paste, but powder. At the Asian market I finally found, the Korean owner showed me two kinds of pepper “flakes” for making Kimchee. However, the only English on the packages of both kinds referred to it as pepper powder not flakes. One is a very fine powder and the other is courser with very small flakes, but still closer to what I would call powder rather than flakes. With my first test batch, before I found that pepper powder, I used red chili flakes that were a combination of whole seeds and large flakes. The result was that the ‘kimchee’ was missing that beautiful red colour that it should have as seen in your photo above. So I guess it was a bit like white kimchee, only spicy. I also didn’t have salted shrimp for that test batch. It was fermented, but didn’t really taste much like kimchee I’m used to. I ate it though, both as is and in soup. So substituted ingredients work, but it does change the taste. Right now I’m soaking my cabbage for my next batch. I’m wondering how important the rinse cycle is. You say to rinse the cabbage three times. Is that to rinse the excess salt off. How important is that process? I found my first batch to be just a slightly bit too salty, but not enough to stop me from stuffing my face. Could that be because I didn’t rinse it well enough? My first authentic batch was still absolutely fantastic though, and so maybe that level of salt is just right since you say below it should be a little salty. I find myself craving kimchee, so perhaps it is filling a particular dietary need. I regret not having done this sooner. You can eat kimchi any time you want, but it will get better with a few more days of fermentation. Some people like fresh kimchi, and some people like it well fermented sour kimchi. It’s a matter of preference. Regular tupperware is okay. Just make sure it’s tightly closed. Thanks, it is delicious! I had to substitute the gochugaru Korean red chilli pepper flakes as they were nowhere to be found here (rural England) so I used a combination of fresh chilli and paprika instead. Also there were no daikon radishes so I just used extra cabbage. There were only English cabbage varieties so I used one of them instead but it still tasted great! I am now making my second batch. I absolutely love your site. I made my first batch of Kim chi yesterday, and it turned out to be too salty. Is there a way to fix it? I was thinking about adding more salted cabbage, but not sure that will work. Do you have any suggestion? Thank you! How salty is it? It’s supposed to a bit salty to eat as is. The saltiness will reduce as it ferments. You can leave it out at room temperature longer to help ferment faster. But if you think it’s way too salty, you can add more cabbage, lightly salted, or cut up some radish and add. Or simply add some water. All depends on how salty it is. What kind of salt did you use? I’d love to know what’s causing the kimchi to be too salty. What kind of anchovies? You can skip salted shrimp and just use fish sauce. I believe I have the same allergy, I call it baalteshuvaitis. I actually made a batch of raddish kimchi last week and used a vegetarian recipe which substituted soy sauce for the shrimp. It definitely worked and was somewhat well received in our Sukkah but I then read that red miso works well too so I added some to the jar and it definitely tasted better. I’ve seen other recipes where anchovies or anchovy paste is used which I think I’ll try next but, for that time of year when we also suffer from acute pesachitis, that paste may or may not work. I Imagine anchovies would but you probably wouldn’t want any of the oil they’re typically packed in. Soaking and rinsing them off to remove the oil would probably work but you’d also be removing some of the necessary salt so you’d have to add some more of that to the mix. 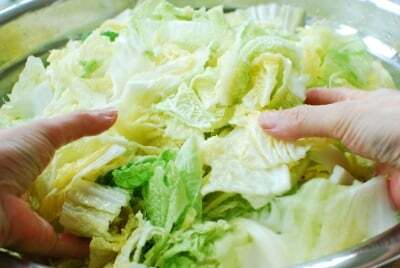 It should be crunchy and chewy after salting because salting draws out the water content from the cabbage. What kind of salt do you use? I used fine sea salt bought from a korean grocery store (I used less than the amount in the recipe). Thanks. I add Shredded radish, Bosh pear, and Jimica to mine ! Hi Hyosun-shi! I’m a Kore-Am living in China right now and am trying to make kimchi because the kimchi here has way too much MSG. Two questions: is there a recipe for 찹쌀풀 and how much you would add in this particular recipe, and second question: they don’t sell 새우젓 here but they do have the tiny salted shrimp. Do you think it would work if I soaked them in some water and used that in lieu of 새우젓? Thank-you for showing step by step process. 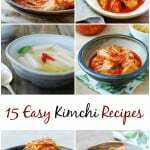 I’ve seen a lot of recipes for kimchee but not as detailed as yours and mine has never come out right until I made it with your recipe. Very much appreciated! aww I’m so happy to hear that! Thank you for letting me know. Cheers! 어제 막김치를 만들었는데 매우지 않아요. 어떻게요? I made some kimchi yesterday but it didnt taste spicy. It feels like the flavor didnt infuse into the cabbage. May i know when you mentioned to leave it out to ferment for half a day, should i do so with the jar lid off or on? You can pour it out of the jar and add more gochugaru since you just made it. Yes, you need to have the lid tightly closed while kimchi is being fermented. Kimchi needs some time for flavors to develop. Hope this helps! 다음에 다시 조리법으로 김치를 만들겠다. I never posted how my mak kimchi turned out even though I made it 3 weeks ago…. I was actually scared of how it would turn out because it was such a large batch and if it didn’t turn out well or at least satisfactory, I was afraid of tossing it. Well, I’m glad to say it turned out super well, better than I imagined. Now I won’t need to buy it from the store anymore. Even my brother enjoyed it and said it tastes like the one from a restaurant! My parents have been out of town since I made it but will return shortly, and I cannot wait for them to try it! Question – my kimchi jar has been in the fridge for 3 weeks now. It looks like the seasoning is separating from the liquid but the flavor is still there. When i shake my kimchi jar, the kimchi juice looks mixed and normal again. Is this normal? 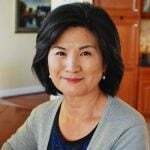 Hi Annie – Congrats on your successful kimchi!! You’re right. It will be hard to go back to store bought kimchi once you experience how easy to make and how much better it tastes. Regarding your question, it’s quite normal. Don’t shake the jar. Every time you take some kimchi out for serving, press down the remaining kimchi to remove air pockets and keep it in the liquid. Hi! I bought one 4 pound napa cabbage and about 4 pounds of baby napa cabbage. I am looking at my largest bowl and I think I must cut the recipe in half and only use 4 pounds cabbage. Please help me cut this recipe in half. I assume the salt would stay the same for soaking. Would all of the spices be cut in half? I just don’t have the room in my bowl to do all eight pounds and I don’t want to do it in two batches. Thank you for your help and your beautiful recipe! Hi Kay – Yes cut everything in half, including the salt and water for soaking. It doesn’t have to be mathematically accurate though. Good luck and let me know how it turns out. I learned about your blog from a co-worker. I made this kimchi yesterday after spying some nice looking napa cabbage at the store. I will tell you, this is the best I’ve tasted. I have made many versions from various recipes and it was always too salty, not salty enough, flat tasting, or even bitter and the red pepper turned a brownish red. The only thing I changed on this recipe- I increased the ginger to 1 tablespoon and the sugar to 2 tablespoons. I like the fresh ginger sweet flavor. I could taste the fresh cabbage flavor also, it is delicious! I just came home from work and devoured a small bowl- no patience to make rice! As it ferments I will look into kimchi rice. Thank you for sharing your talent with us. I don’t know if you realize how many people you touch. I was born in S. Korea and adopted in 1974- my biological mother is Korean. I left when I was 5 years old and the smell and taste of Korean food was my earliest and strongest memory. So, thank you!! Thanks Hyosan for a really great website. I have been an avid fan of your Kimchi for over a year now – making it is a weekly ritual. I don’t use any fish products but instead use Korean Soy sauce instead – I’m very happy with the result too. Interesting to add that my diet now includes probably over 70% Korean dishes compared to a year ago …..and, I feel [and look!] a lot healthier. Thanks again Hyosan. You can add more salt while it’s still fresh. Hope it turns out well for you. Thanks for liking my website! Nice! It’s interesting to hear Polish fermented cabbage helped kimchi to ferment faster. I’m so excited to make my very first kimchi. Everything is ready to be mixed together as soon as the cabbage has finished salting. I left out the salted shrimp, because I can’t get it here. I tasted my seasoning without it and its delicious! Thank you for sharing your recipes and expertise. Great! Hope it turns out well. Make sure the seasoning is a bit salty to eat as is. I followed the recipe- man kimchi. It was easy to follow but it came too salty. What did I do wrong? Hi Young Ae! Did you use 2 cabbages that are about 8 pounds? What type of salt did you use? If you used fine salt, you should have used much less than the recipe calls for as stated in the recipe. Did you wash well after salting? One of these could have affected the salt level. Let me know. Do I put the lids on right away or wait till they go in the fridge? Fantastic recipe, I also threw in some mustard greens and it was great. Mustard green is great in kimchi! first of all, thank you for putting this recipe up. this is wonderful. i am allergic to shrimp. may i know if there is substitute ingredient for the salted shrimp? Hi, I love your mak kimchie recipe and it’s so easy and tasty. I add on 2 Korean pear and carrot, I used less sugar because the pear so sweet. It taste so good, I got compliments from my family. Thanks to you . Hi, if I am using 1/4 of the cabbage amount- do I reduce the water or salt by 1/4? My children miss Korean kimchi and the commercial ones ( Australian made and Korean imported ones ) are just too spicy for them even if I try washing it, or cutting it up. I like my kimchi very spicy and ripe. But the toddlers- thank goodness they don’t reject spicy food- like it less salty and spicy. They are so proud they are eating red kimchi. Thank you for the recipes, I have used a lot and I like the fact the recipes are less salty than the ones elsewhere because I am cooking so many Korean jjigae and banchan for them. Man I wish they would import the Korean children kimchi packs here. it would make my life so much easier. Hi! Yes reduce the water and salt (and everything else) proportionately. It’s great that your toddlers eat kimchi. Simply use less gochugaru, and look for gochugaru that are not too spicy. 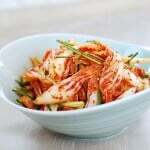 You can also use my white kimchi recipe and a little gochugaru to make it a little reddish. Hope this helps. Thank you so much for the recipe, you never disappoint! Your method of dissolving salt with water was genius. It’s much better than sprinkling salt and pouring water! I also failed to heed your comment about using less salt if not using coarse sea salt. My radishes were pretty salty, but still tasty. However, I did make two changes. I added puréed onions and rice flour paste. This was the best recipe so far! I did not have salted shrimp so I used some broth from clams that was reduced down till it was very salty. My Korean friend loved it and asked me to give her the recipe! She makes hers with raw squid. Can I use tomato purée instead of red pepper powder? That will not be kimchi, but an interesting idea! Try to puree red bell peppers instead. Still not how kimchi is made, but it will be better than tomato paste. 1/4 cup is 4 tablespoons, and 1/3 cup is a little more than 5 tablespoons. Hope this helps. Thanks for the useful information. If my kimchi is too sour after 1 week in the fridge, can I still add diced apples or pears to it? Is it necessary to puree the apples / pears? 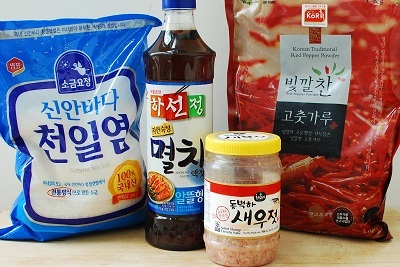 Hi, can I use gochujang paste to make kimchi? You can use it a little if you want, but it’s not typical for this type of kimchi.